It’s easy to hear what one of the major carriers has to say. After all, their ads flood TV screens, their billboards dot the highways and it often seems there is a store at every strip mall. But it’s harder to hear all four carriers at once. Such a gathering was expected at last year’s CTIA show, but T-Mobile’s CEO pulled out after AT&T announced its proposed deal on the eve of the show. The three remaining CEOs did share a stage in a panel moderated by CNBC’s Jim Cramer. This year, though, top executives from all four are slated to face off in an afternoon keynote again moderated by Cramer. 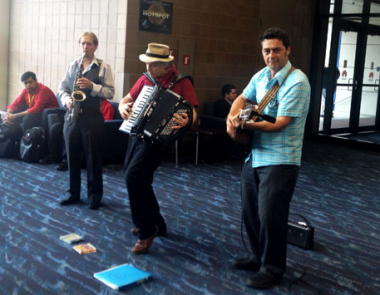 AllThingsD will have live coverage starting in just a few minutes, at 4:30 Central Time (2:30 pm PT). 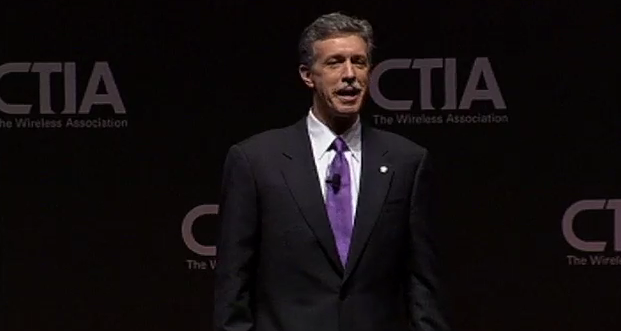 4:38 pm: CTIA chief Steve Largent is onstage, introducing the four chiefs. 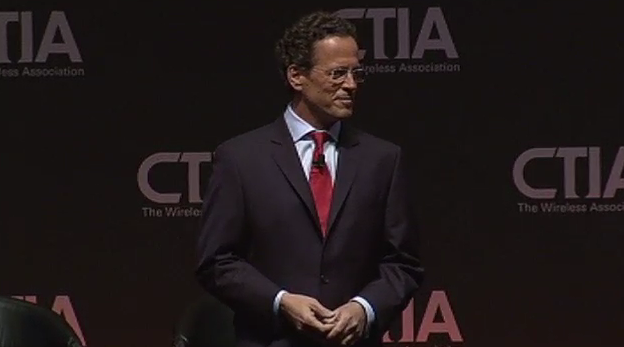 Of course, left to his own devices, the Verizon Wireless CEO is talking about the spectrum crunch. 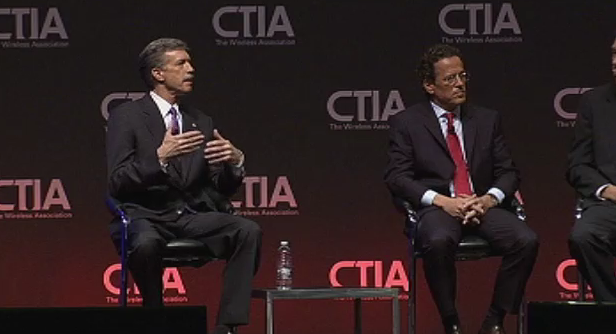 If preaching to the choir were illegal, most of the folks at CTIA would be in jail by now. I thought this was supposed to be a roundtable. But we are getting a stump speech. I hope there won’t be four of these, but starting to fear the worst. 4:44 pm: Okay, I’m told that there will be a roundtable, but first we have to sit through four speeches. 4:45 pm: Mead is advocating for Verizon’s pending deal to acquire spectrum from the cable companies. We’re confident regulators will understand this purchase is good for Verizon Wireless customers and the entire broadband economy, Mead said. Mead touts Verizon’s recent offer to sell off some other spectrum if regulators give the cable deal the okay. 4:47 pm: All right, Mead’s done. Next up: Sprint CEO Dan Hesse. Hesse is talking LTE, or as he calls it “Lots to Explain.” Many customers don’t know what 4G is and Hesse says the industry has itself to blame. 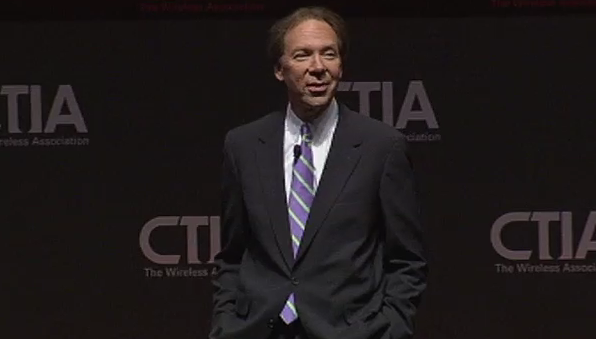 He notes that even the oil industry gets higher satisfaction ratings than cellular carriers do. 4:52 pm: Hesse takes aim at well-liked tech companies like Apple and Amazon. Now he’s touting the Sprint Guardian services that it introduced earlier today. 5:00 pm: Hesse promises a new mobile advertising program coming soon, giving consumers control and options. Hesse said Sprint will enlist an outside firm to verify the company is delivering what it says, like financial auditors do for the books. Hesse said the industry can also work together in some of these areas. “Collectively we need to build trust,” he said. 5:03 pm: Hesse wraps up, ceding to T-Mobile CEO Philipp Humm. 5:05 pm: T-Mobile is back, Humm begins, echoing the refrain he has been repeating since the Consumer Electronics Show in January. Humm offers a subtle take on data and congestion — “Intelligent unlimited rate plans are the future,” Humm said. One can assume that by intelligent, he means plans like T-Mobile’s that throttle users once they hit a certain data cap. 5:07 pm: Yep. Now he’s touting T-Mobile’s take on data plans, offering unlimited with no overages but limits on how much 4G data they can consume. Humm promises more of the same to come. “That won’t be enough,” he said, noting that T-Mobile and others need innovative technology and additional spectrum. In the U.S. the spectrum problem is particularly acute. Humm touts what T-Mobile is doing to make the best use of the spectrum it has. Will be interesting to see if he jabs back at Verizon, which T-Mo has accused of warehousing excess spectrum. 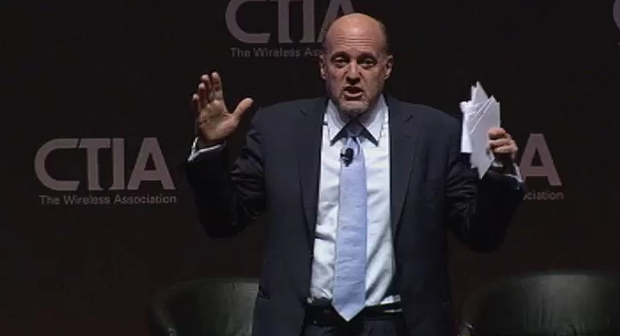 So far, he’s just talking about other technologies like Wi-Fi offload and off-peak delivery. The company releases first quarter earnings on Thursday, so Humm isn’t saying much about where things are at right now. 5:13 pm: T-Mobile tripling business salesforce as the company attempts to evolve into a serious business-to-business player. Humm said T-Mobile wants to be known for more than just low prices. 5:15 pm: T-Mobile is back going after AT&T and the iPhone. New ad shows Carly on a motorcycle speeding past the AT&T iPhone. 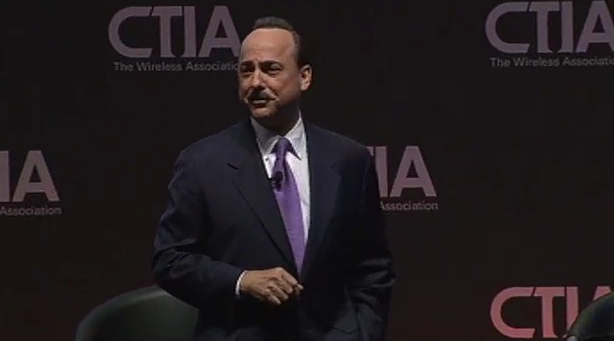 OK, last of the stump speeches as AT&T Mobility unit President Ralph de la Vega takes the stage. 5:17 pm: De la Vega touts a PC World study that found AT&T’s LTE network to be the fastest (Verizon touts a separate one that found its network fastest). 5:18 pm: De la Vega now pitching the home security service it introduced on Monday. 5:32 pm: De la Vega wrapping up, leaving just under a third of the 90 minutes for the roundtable. 5:33 pm: Boo-yah. Here’s Cramer. 5:35 pm: Cramer starts by giving each company one minute to answer a few questions. Biggest innovation since last year. Mead: Video delivery over mobile devices. 5:37 pm: Next question: What are we going to have a year from now that we don’t know about now. Mead: I think you are going to see a lot more activity of consumers exploring what they can do on LTE. Humm: Evolution from access provider to service providers. Voice and text will decrease in importance. Hesse: Privacy, safety and security will replace speed and technology as the main point of discussion. De la Vega: Mobile payments. “It’s time for the smartphone to replace the wallet.” Partnerships are coming together. 5:44 pm: Cramer challenges Mead on whether Verizon has too much spectrum. Cramer asks about T-Mobile’s new ad touting its network as being faster than AT&T’s iPhone. Humm clarifies that the ad is pointing out that the iPhone is slower, not AT&T’s LTE network, which is faster. 5:55 pm: Cramer asks Humm if without an iPhone to sell, isn’t T-Mobile forced to just race to the bottom on price? “Pure price competition would be the wrong way to go,” Humm said, saying that it needs to find different kinds of unlimited offerings. 5:56 pm: Asked about the impact of cellphones in uprisings across the globe, Hesse noted that phone ownership varies and so does the impact. Very high in places like Egypt, but lower in Syria and very very low in North Korea, at 4 percent. The privileged are the ones who have cellphones and they are not going to want to upset the applecart, Hesse said. 5:59 pm: Could T-Mobile USA go public? “I think it is the perfect audience here to make a big announcement,” Humm said, before, of course saying little. 6:01 pm: Cramer asks the panel if Facebook is a good thing for the industry. All agree that it is, but Mead won’t comment on whether it should be worth more than Verizon. 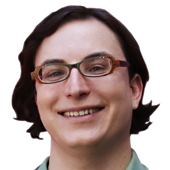 6:02 pm: Is Apple a friend, foe or both? Friend, said de la Vega. 6:07 pm: And … we’re out.